In the lower Miocene of East Africa (24-16 Myr ago), apes were more abundant than anywhere today. 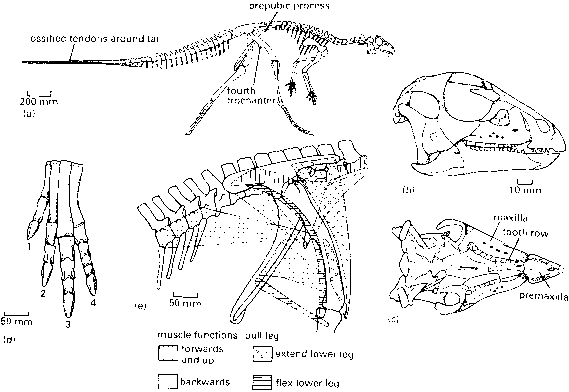 A typical early form is Proconsul (Walker et al., 1983; Walker and Teaford, 1989). The genus was named in 1933 on the basis of some jaws and teeth from Kenya, and the name refers to a chimp named Consul who then lived at London Zoo and entertained visitors with his bicycle riding and pipe smoking. 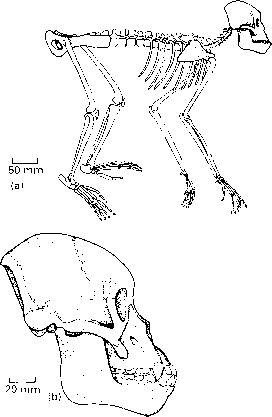 Since the 1930s, evidence of most of the skeleton has been found, including several well-preserved associated skeletons (Figure 11.4). and long projecting canines (Figure 11.4(b)). Its diet was probably soft fruit. Proconsul is regarded as a true ape because it shows a number of derived characters shared with the modern forms, such as the absence of a tail and the relatively large brain size (150 cm3). In addition, Proconsul shows a number of other ape-like characters of the teeth and modifications to strengthen the elbow joint for brachiation. The story of ape evolution continued in Africa during the mid- and late Miocene (16-5 Myr ago),but some lines branched off and evolved separately in Europe and Asia. The gibbons, four species of Hylobates,are the most primitive of living apes, and they appear to have branched off the line to the great apes, the Hominidae,in the early Miocene,but no fossils are known. The living Hominidae fall into two subfamilies, the Ponginae,the orang-utan and its fossil relatives, and the Homininae, chimps, gorillas, humans and their fossil relatives (see Box 11.3). This split marks a divergence in modes of locomotion from a generalized tree-climbing ancestor: the orangs specialized in suspension (brachia-tion) and slow climbing, whereas the African great apes specialized in terrestrial quadrupedalism (chimps, gorilla) and bipedalism (humans).